Mix one scoop (5 grams) with 4 to 6 oz. of water and take both before and after training. For optimal results, take an additional serving prior to bed. Serving scoop included, but may settle to the bottom during shipping. Concerning California Residents: This product contains chemicals known to the State of California to cause cancer and birth defects or reproductive harm. Do not use if pregnant, contemplating pregnancy, or nursing. This product is only intended to be consumed by healthy adults 18 years of age or older. Before using this product, consult with your physician. Discontinue use and consult a health care professional if you experience any adverse reaction to this product. Do not use if the seal is broken or missing. 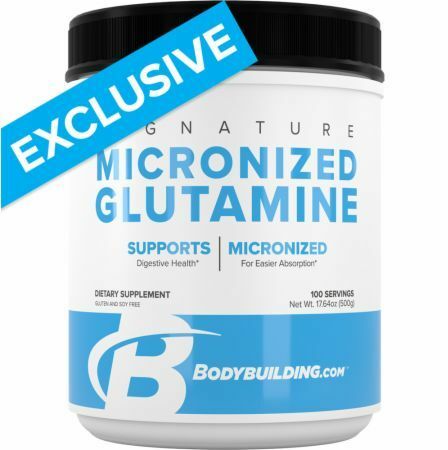 Pure, Simple, Versatile: Micronized Glutamine is dosed effectively, mixes instantly, and is completely tasteless! Micronized Glutamine mixes instantly and is completely tasteless. Consider adding it to your pre-workout drink, your post-workout protein shake, flavored creatine powders, or your favorite sports beverage. Here at , our goal is to help people like you meet your health, fitness and appearance goals through information, motivation and supplementation. We want you to have every possible tool at your disposal, so we constantly add more articles, videos, workouts, diet plans and transformation stories to our website. We've also developed a full line of our own nutritional supplements that—when combined with the right workout and nutrition program—will help you reach your goals. All products have been formulated to the highest standards with high-quality, effective ingredients that produce real results. If you aren't completely satisfied with any product, return it any time for a full refund.